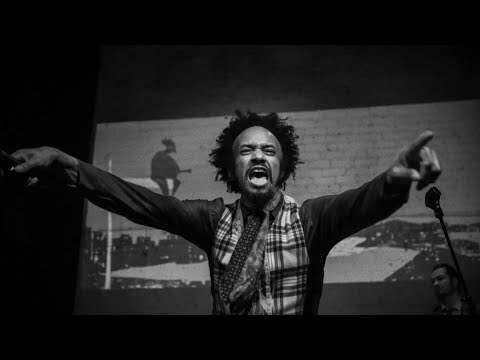 Fantastic Negrito is the incarnation of a musician who is reborn after going through a lot of awful s**t.
In fact, the name Fantastic Negrito represents his third rebirth, literally coming back from death this time. The narrative on this man is as important as the sound, because the narrative is the sound. Songs born from a long hard life channeled through black roots music. Slide guitar, drums, piano. Urgent, desperate, edgy. Fantastic Negrito is the story of a man who struggled to “make it”, who “got it”, who lost it all, and somehow managed to find his way back. These are singular songs by a true musician who writes and produces his own work. His songs are his fuel as he continues on the third comeback of his life, at a time when our world is in upheaval. The first life (‘who am I and where am I going?’). Fantastic Negrito was raised in an orthodox Muslim household. His father was a Somali-Caribbean immigrant who mostly played traditional African music. When, at the age of 12, Negrito’s family moved from Massachusetts to Oakland, he was hit with an intense culture shock. Oakland in 1980s was a million miles from Negrito’s conservative childhood. He went from Arab chants to Funkadelic in one day, living in the heart of one of the wildest, most infamous, most vibrant black communities in the nation. S**t was extra real in Oakland. By the time he was 20, Negrito had taught himself to play every instrument he could get his hands on. He was recording music, but he was also caught up in street s**t. This went on for several years until a near death encounter with masked gunmen. After that, Negrito packed his bags and headed to LA, armed with a demo on cassette. The second life (‘I want to be a star…I think’). It didn’t take long for Negrito to find himself entrenched in the ‘Hollywood’ lifestyle; “clubs and b**ches and bulls**t politics that have nothing to do with great music.” Negrito signed with a big-time manager and soon after that, a million dollar deal at Interscope …and soon after that, creative death. The record deal was a disaster. Gangsta rap ruled the airwaves and Negrito was in the wrong place at the wrong era. Negrito came out of the deal with a failed album and his confidence gutted. He was infected by the constant emphasis on ‘what would sell’; which looks, hooks and gimmicks would attract an audience. He lost all sense of himself. The songs stopped coming to him, so he quit. He sold all of his s**t and he quit. With his son’s entrance into the world, all the creative energy Negrito bottled up came rushing out. His musical choices were sharp and without doubt. He began recording without the hindrances that come with chasing trends. “F**k what’s hot now, what moves me?” Negrito turned to the original DNA of all American music, the Blues. The beating he took in life had given him primed him to channel his literal and musical forefathers: the Blues musicians of the Delta. In less than a year Negrito would go on to win the inaugural NPR Tiny Desk contest. The following year he released his debut full-length album The Last Days of Oakland, which was immediately met with critical acclaim. NPR called it “among the rawest pieces of music — sonically and emotionally — you’ll hear all year.” The album went on to win the Grammy for Best Contemporary Blues Album in 2017. But none of this has been about awards or acclaim or validation. Negrito chased those before – and it nearly killed him. Now, as he looks around, sees the world going on a similar journey… especially America. This is a man who knows what it looks like to drive off a cliff. America has lost its way, and now we are paying the price. Fantastic Negrito’s 2019 Grammy-winning album Please Don’t Be Dead is about what comes next.